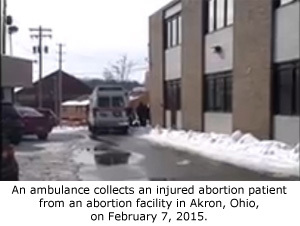 Operation Rescue has documented that four women were transported by ambulance from abortion facilities across the U.S. over the weekend of February 6-7, 2015. Half of the facilities where medical emergencies occurred were Planned Parenthood abortion clinics. “We have been overwhelmed with reports and photos of incidents in four different states. We are working as fast as we can to investigate them further and get complaints out to the appropriate state agencies,” said Troy Newman, President of Operation Rescue. • Planned Parenthood, Houston, Texas, February 6, 2015. • Planned Parenthood, Riverside, California, February 7, 2015. • Little Rock Family Planning Services, Little Rock, Arkansas, February 7, 2015. • Akron Women’s Medical Group, Akron, Ohio, February 7, 2015. 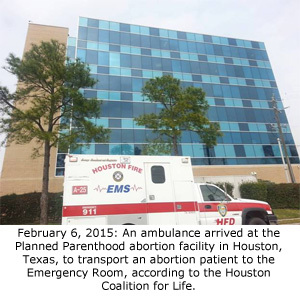 In Houston, activists with the Houston Coalition for Life reported that the ambulance turned off lights and sirens when leaving the Planned Parenthood abortion facility on Gulf Coast and only reactivated them after turning the corner onto another street. The ambulance was seen headed in the direction of Ben Taub Hospital, where other women injured by abortions at Planned Parenthood were also sent. Operation Rescue has documented at least five other medical emergencies at this Houston Planned Parenthood facility, including one involving a confusing 911 call placed on behalf of a 33-year old woman suffering massive hemorrhage in March 2015. Court records indicate that as many as 1,000 women are hospitalized in Texas each year due to abortion complications. 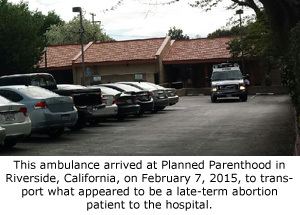 Riverside ambulance 02072015.jpgA former member of The Survivors had the presence of mind to snap photos when an ambulance arrived at the Riverside Planned Parenthood abortion clinic in response to a medical emergency at 12:15 pm on February 7, 2015. The witness reports that the suffering woman was brought out of the abortion clinic on a gurney. A sheet covering her failed to conceal a visible bulge in the woman’s abdomen, indicating that she was in the advanced stages of pregnancy. The condition of this woman remains unknown. A 21-year old woman, Edrica Goode, died from complications to an abortion she received at this same Planned Parenthood facility on January 31, 2007. Abortionist at this facility include Katharine Sheehan, Martin J. Roitman, Son H. Nguyen. 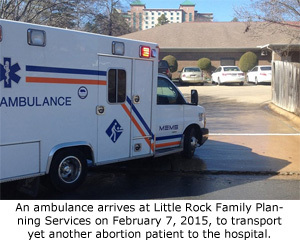 The fifth medical emergency documented at Little Rock Family Planning Services since January 2014, took place on February 7, 2015. Activists with Every20Seconds.org posted video of the incident on Facebook, which showed one of the clinic escorts laughing and dancing as she helped other clinic workers display sheets and blankets to prevent pro-life supporters from photographing the incident. The abortionist responsible for the carnage at Little Rock’s last remaining surgical abortion clinic appears to be Thomas H. Tvedten, who once sued to block a ban on the heinous Partial Birth Abortion procedure, which is now outlawed in the U.S.
As reported by Operation Rescue earlier, an abortion patient was rushed to the hospital after suffering complications to an abortion at the Akron Women’s Medical Group on February 7, 2015. That facility has repeatedly failed inspections by the Ohio Department of Health with serious violations including untrained staff and general filth inside the clinic. Abortionists at the Akron facility include Mohammed Rezaee, Raymond E. Robinson, and Lucy Ann Nunnally. Operation Rescue encourages pro-life activists to send photos and other information regarding medical emergencies they observe at abortion facilities to us at info.operationrescue@gmail.com.